← Come to Antigua and have a great time, Antigua style. Times change. So far, so good. Now that I am settled, sort of, into the reality that cold is going to be the word of the day for the next few months, I have been wondering exactly what I will write about. In years passed before I retired and we headed south for the winter, I somehow found a way to keep posts flowing, but for this winter I fear that I will find myself at odds as to what I can write about for the next few months. 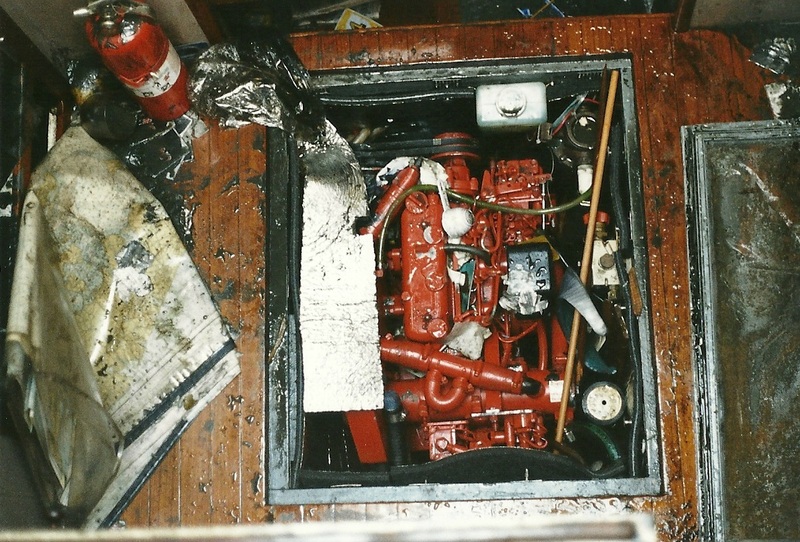 It’s really easy to write about boats and such when we are aboard one but now, not so easy. Sure, I can write about the upgrades to Pandora but just how much scintillating prose can one absorb about heat guns and scrapers as I tease out the mess that’s ,no longer, holding up the headliner? No, instead I’ll, well I’m not sure what I’ll write but I’ll try to make it interesting. So, yesterday I went up into the attic to pull out a few boxes, and let me tell you these boxes are big, full of years of photos, both prints and 35mm slides. I’ll admit that I got a bit teary eyed as I sorted through nearly 50 years of photos trying to decide where to begin. As it’s close to Christmas as I write this, I also found myself thinking about an Osborn Family Tradition of watching National Lampoon’s Family Vacation with Chevy Chase, on Christmas Day, after all the packages are unwrapped. Griswold had the crying gene too, big time. My trip to the attic reminded me of the scene in the movie when he becomes trapped up in the attic. If you recall the scene, skip this 2 minute clip. If not, view on and you’ll get the idea. And, speaking of wonderful memories and old photos. I ordered a photo converter that can handle negatives, slides and prints and scan them to digital. It’s a pretty neat unit and I should have it in a few days. No wait, it’s going to arrive on Tuesday. Amazon promises…and I believe. I BELIEVE! We have been planning to get a quality scanner for some time now as Brenda still has hundreds of slides to scan for the book she’s working on about Archie Brennan, the tapestry weaver and her long time teacher so we needed it anyway. “So, Bob, do tell. 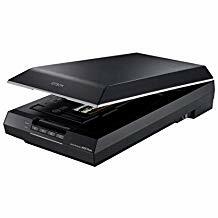 What scanner did you order?” Well, if you insist, it’s an Epson Perfection Document Scanner, and can handle slides, negatives and photos as well as digitize text from a book or magazine which will make plagiarism ever so much easier. I chose this particular model as it was recommended by Brenda’s publisher as easy to use and fairly fast, even with high density scans. It even has a few “magic” features that removes dust spots and scratches as well as re-color faded slides and photos. How do it do dat? 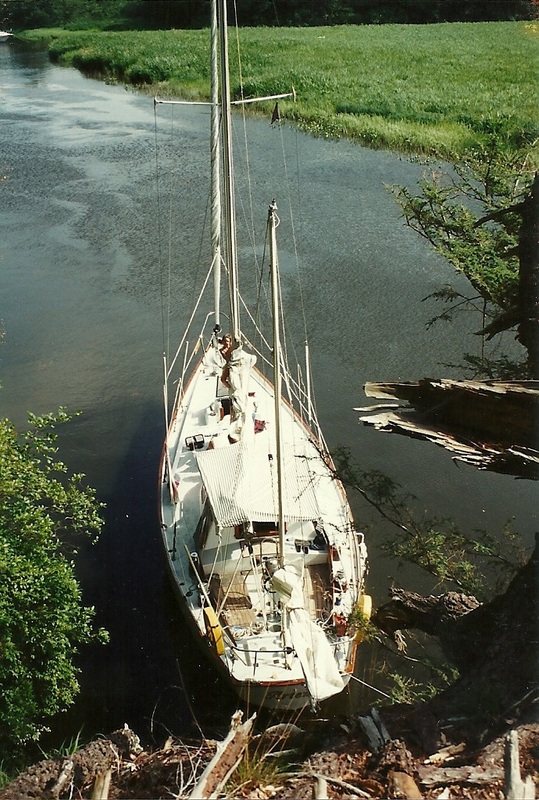 In the meantime, I thought it would be fun to kick off this “series” and write a bit about Artemis, our third boat that met an unfortunate and untimely death when she tangled with a granite dock years ago. 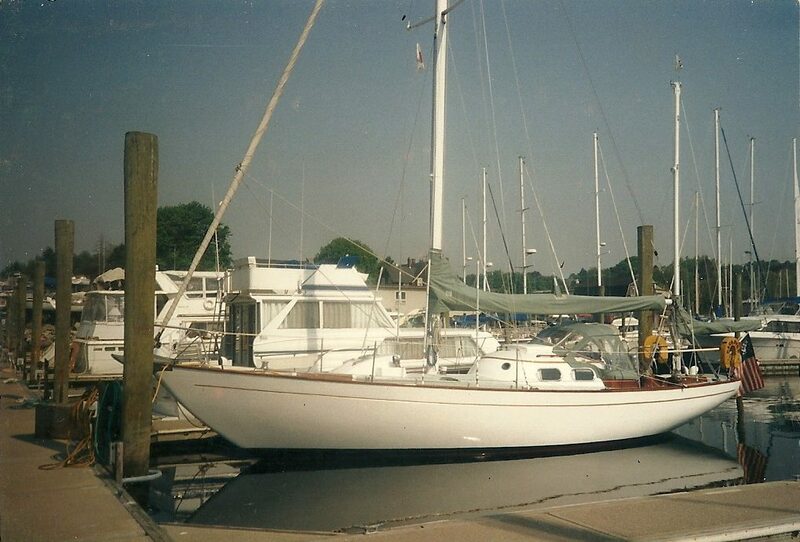 Artemis was a Pearson, Invitca Yawl, built in 1962, one of about 10 built from Bill Tripp Sr’s design. I am told that the design was similar in form to a Bermuda 40, which you can see from the lines. She was a beautiful, if slow boat. 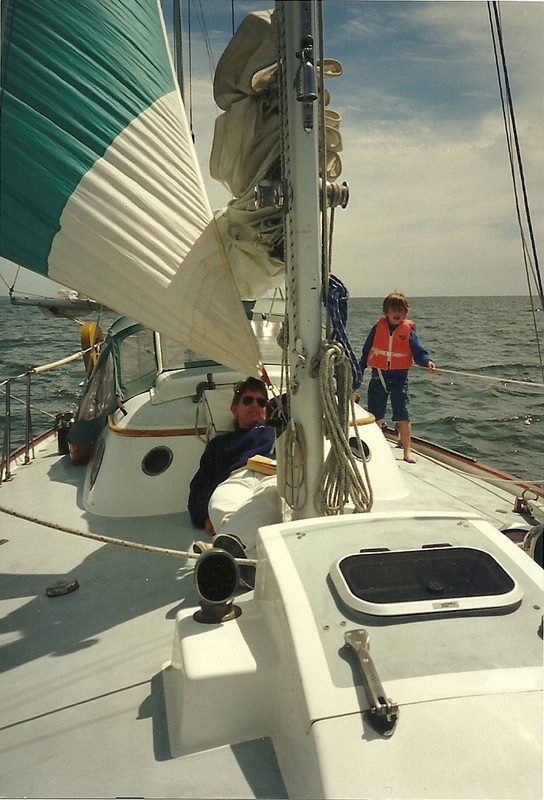 We sailed her quite a bit, although she wasn’t very fast, with her 25′ waterline and small sail plan. 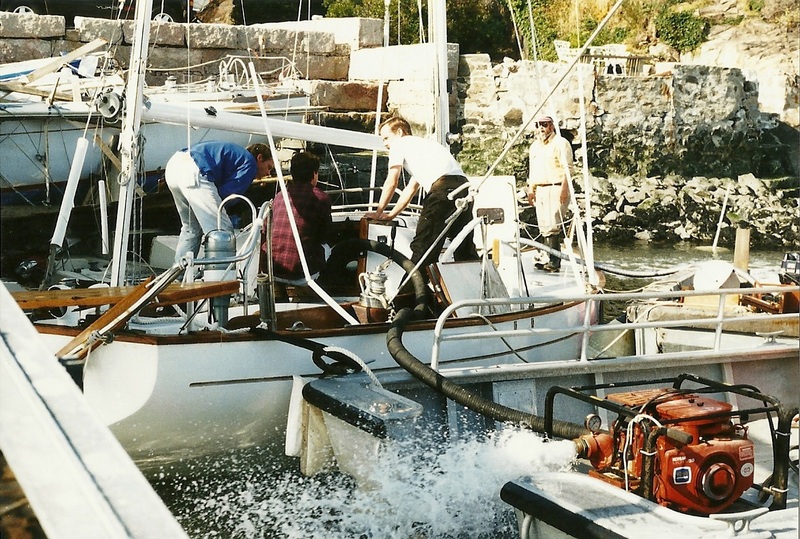 As a particular point of interest, Artemis had a famous sibling, Burgoo that won first place, for the entire 142 boat fleet, on corrected time of course, the Bermuda race in 1964. Event the NY Times wrote about her feat in this article. Don’t you just love Google? So, back to Artemis, and our time aboard her. We spent a lot of time cruising in those days although it was always in short stints over weekends and our obligatory summer vacation. Our boys Rob and Chris were a lot smaller then. Along the way, we often visited Selden Creek, on the CT River, not far from our home now. It was, and still is, a beautiful spot. However, we don’t visit aboard Pandora as she’s as long as the creek is wide and draws to much water to get over the bar where the creek meets the river. Don’t tell anyone but I was trespassing when I took this photo, probably in 1995. Like the bimini? I was a striped bed sheet. Only the finest. A lazy day ghosting along in light air with her mizzen staysail up and drawing nicely. Brenda and Chris enjoying the easy sail. I always thought that she was had beautiful lines, and felt the same way about Artemis. 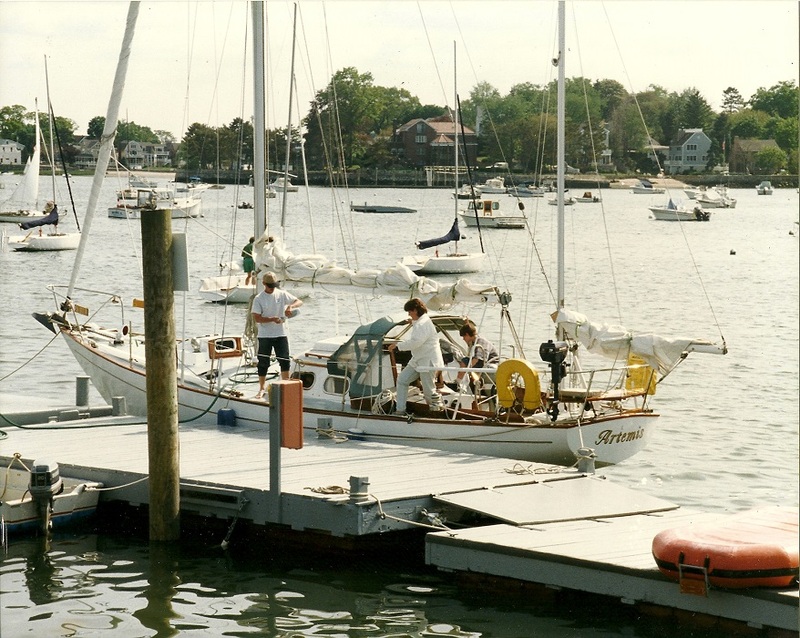 Here we are at the dock at Norwalk Yacht Club, where we were members for many years. Yes, we had some great times aboard. 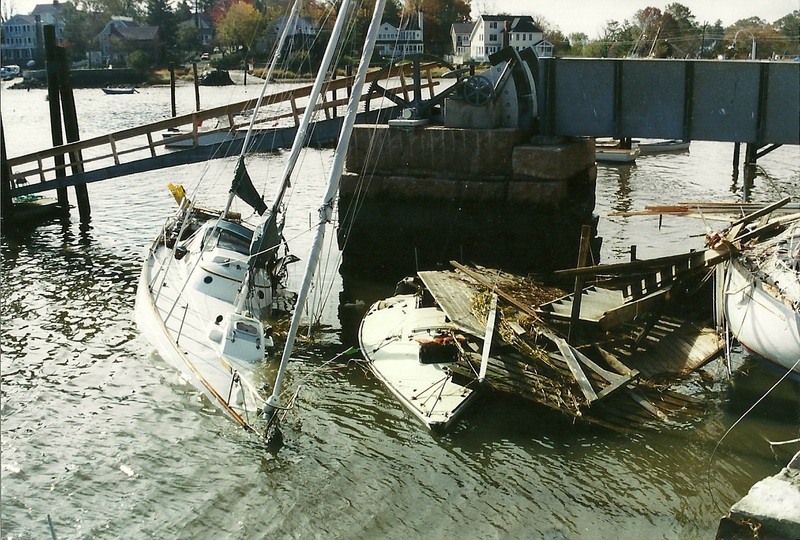 However, good times do come to an end, sometimes more dramatically than others and Artemis met her end in the harbor during the October nor’easter of 1996. 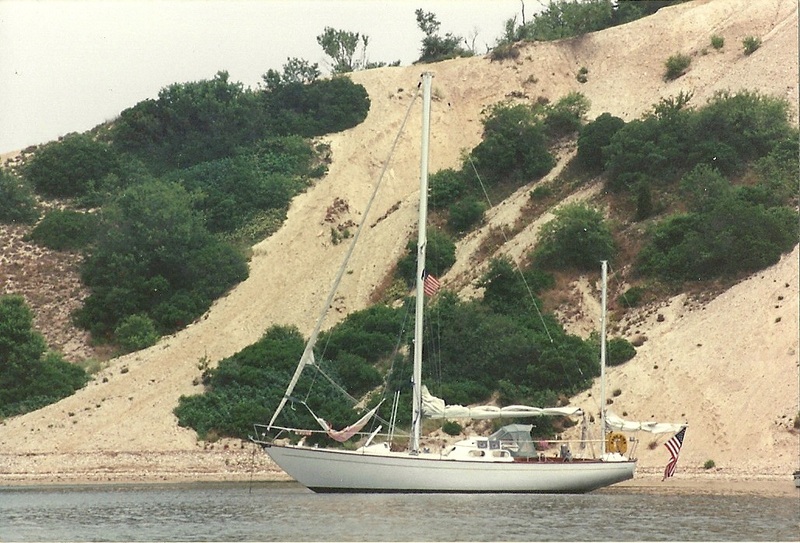 Many boats went up on the rocks in Long Island Sound that night, over 200, I heard. 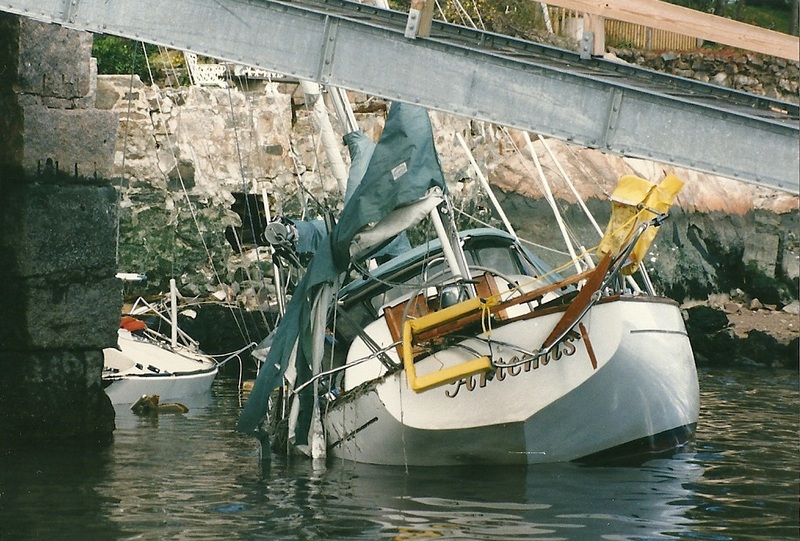 There was considerable damage in Wilson Cove, where Artemis was moored with nearly every boat ripped from their moorings. I had received a call from the club that Saturday morning reporting that “Artemis isn’t on her mooring”. Off to Norwalk I headed, not knowing what I’d find. 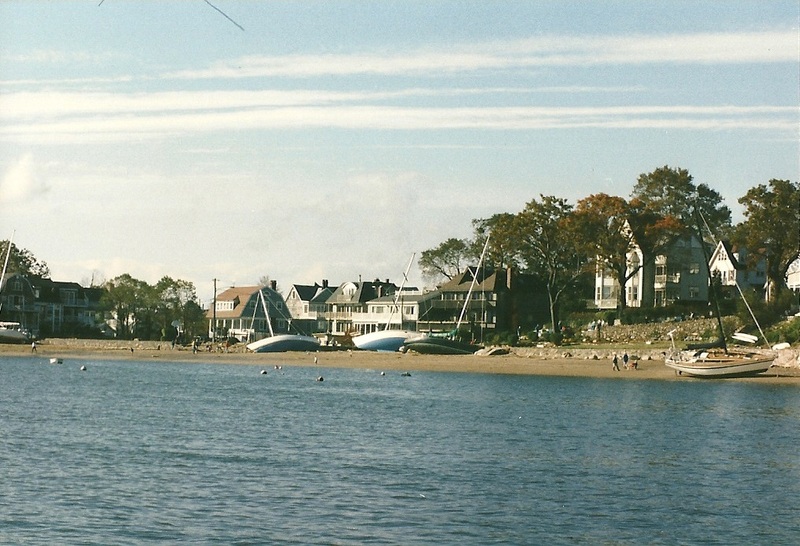 The beach near the club was littered with boats washed up on shore. 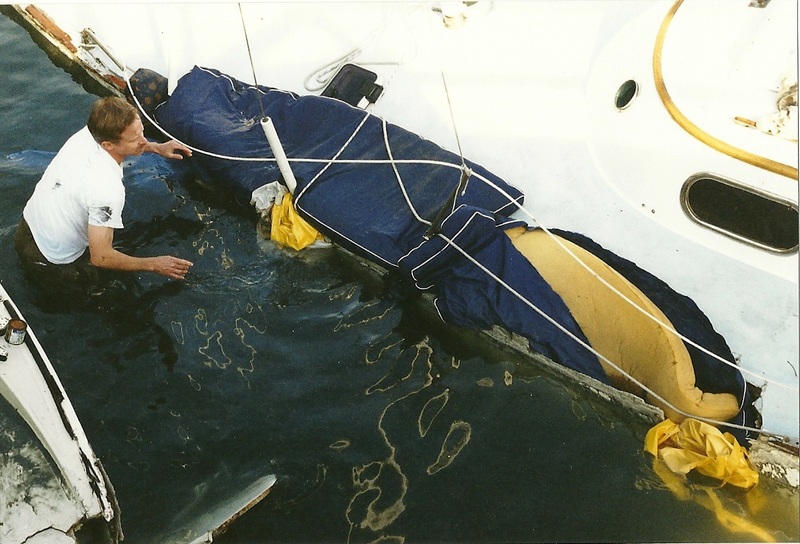 During the few short years I owned her, I took great care of her and did what I could to make her a proper yacht. The name on the transom was hand painted by a sign painter. That was in the days before the computer created vinyl lettering of today. So, there I found her, poor Artemis, tucked up against a granite dock. 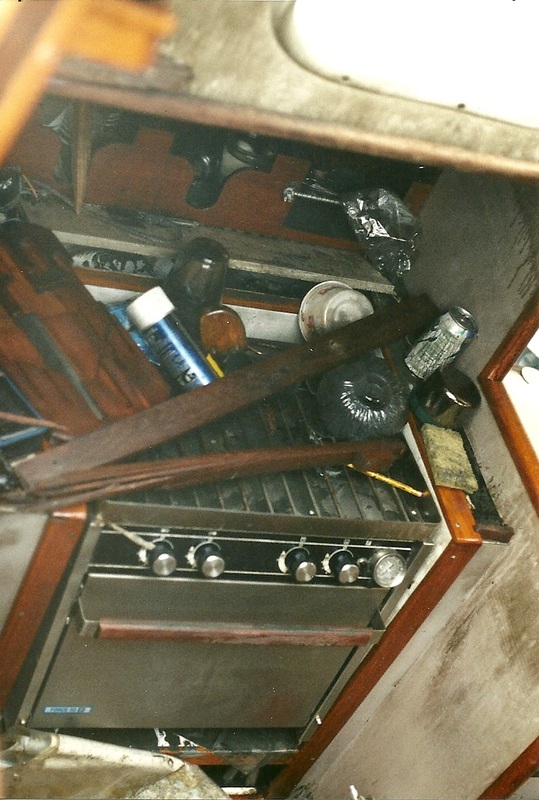 You can’t see it, but she was sitting on top of a J24 which she had crushed under her heavily built fiberglass bulk. You know the phrase, “they don’t build them like they used to?” That’s how Artemis was built, but she was still no match for the granite blocks she was pitted against. They duked it out, Artemis and the dock, for hours and the dock won. Being the “d0-it-yourselfer” I was and still am, I set about to salvage her myself. 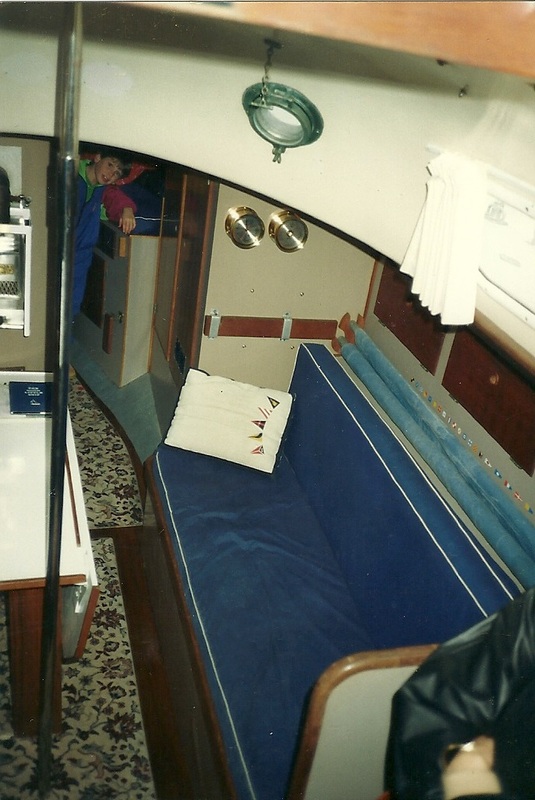 First I stuffed bedding, cushions and towels in the huge crack, over 30′ long that ran down much of the port side where the deck and hull separated. 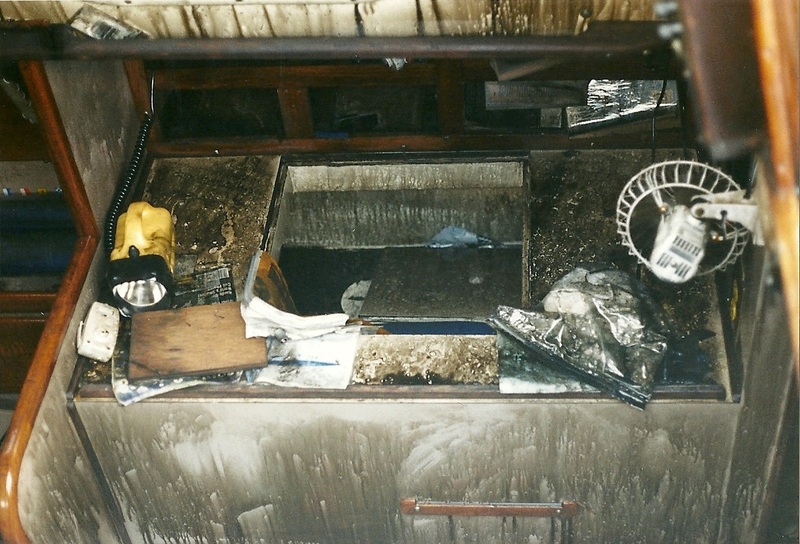 Notice the oil slick that covered everything down below and around the boat. I was able to get a work boat from Tavern Island nearby to help pump her out with a huge fire pump. All that “stuffing” of the holes helped and once the bulk of the crack was above water, up she rose like Lazarus, from the depths. When the pumps finally took hold she came up in only a few moments. Then I towed her to a marina where she was hauled out of the water. I don’t want to think about what would have happened if she had sunk in the middle of the channel on the 2+ mile run to be hauled. Oh, the ignorance of youth. 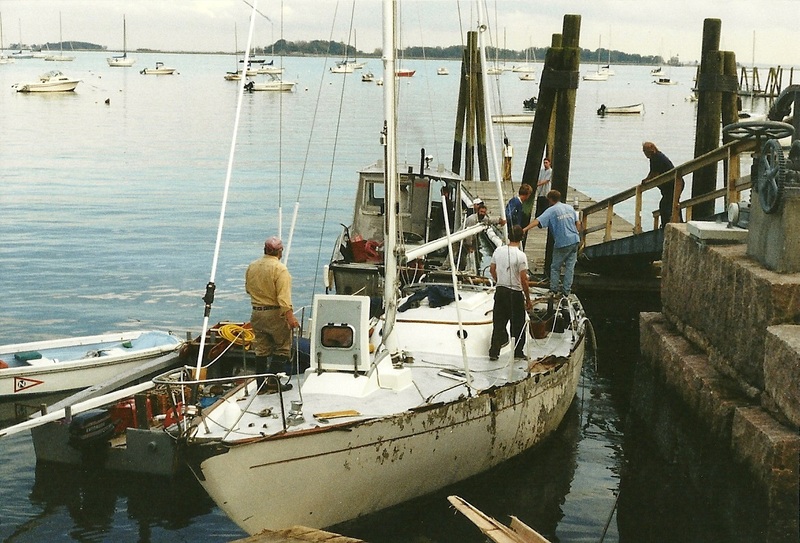 Actually, she was scheduled to be hauled for the winter a few days from then as we had our “final” cruise for the season on Columbus Day, only a few days before the storm hit. 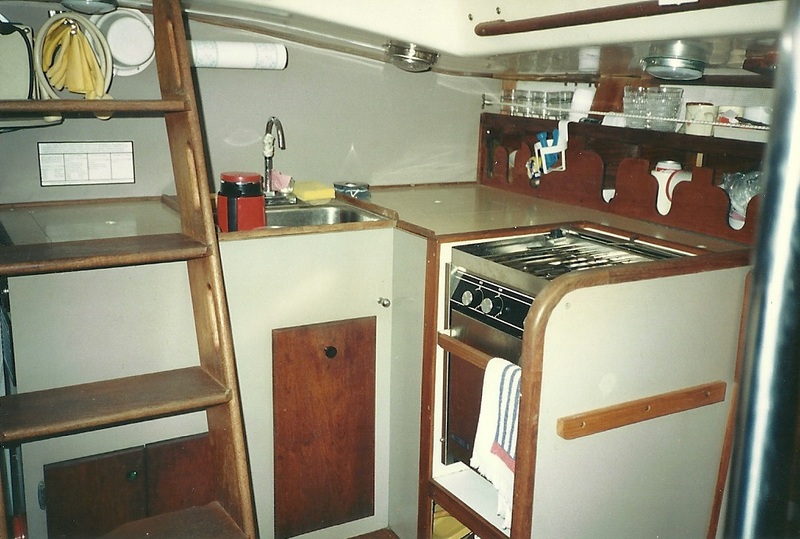 She had a lovely galley with a very nice Force 10 Stove and oven. Not quite as nice after… How about the fridge. At least, I think that’s what this was. Those cushions, the ones I plugged that 30′ crack with, well, they were never all that nice. 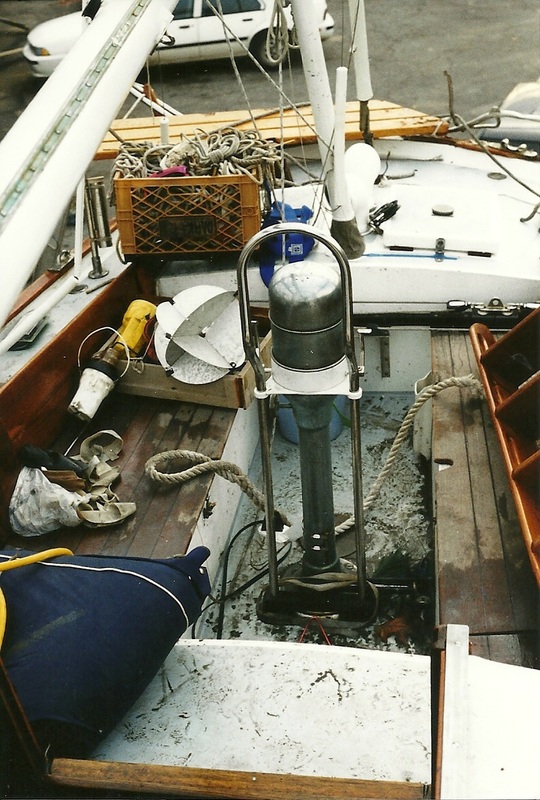 But, by comparison, beautiful… Oh yeah, we had recently had her re-powered, about a month earlier actually, with a brand new Westerbeke diesel replacing her worn out Atomic 4 gas engine that finally gave up the ghost on our trip up to Martha’s Vineyard only two months earlier. I think that the engine only had ten hours on it. Particularly easy access from the cabin sole and particularly easy access for the engine oil and diesel to rise up and soak everything. Thank goodness that the EPA wasn’t paying attention as I worked to raise her. 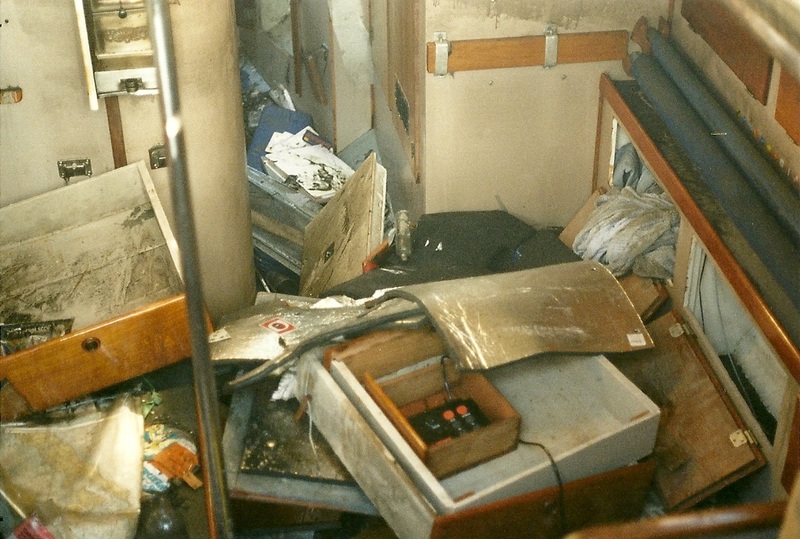 Note the mooring pennant in the cockpit. Oops. Didn’t hold. She was a great boat and, boy, was I sad when I lost her. However, she was the only boat I ever owned that actually paid me back. Not only was she insured for an agreed value of twice what I paid for her, prior to all the improvements, but I was also paid to salvage her. When all was said and done, I ended up nearly doubling my money. Not likely to EVER happen again, that’s for sure. We are talking about boats, after all. However, like many smitten by being on the water, I quickly doubled down and brought a boat that was cost even more, Elektra, our Tartan 37. But, that’s a story for another post. so stay tuned. Of Artemis, I will always have fond memories of times aboard with Brenda and the boys. Especially in “The Pit” in Port Jefferson, Long Island. Those were great times. Well, great except when the weather was crappy, the wind was unfavorable and everyone was feeling a bit under the weather. Perfect except for that… These days that harbor is chock full of moorings and it’s party city on the weekends with boats rafted up from one shore to the other. A lot of water has gone over the dam, we’re retired now and both Rob and Chris are on their own and doing well. 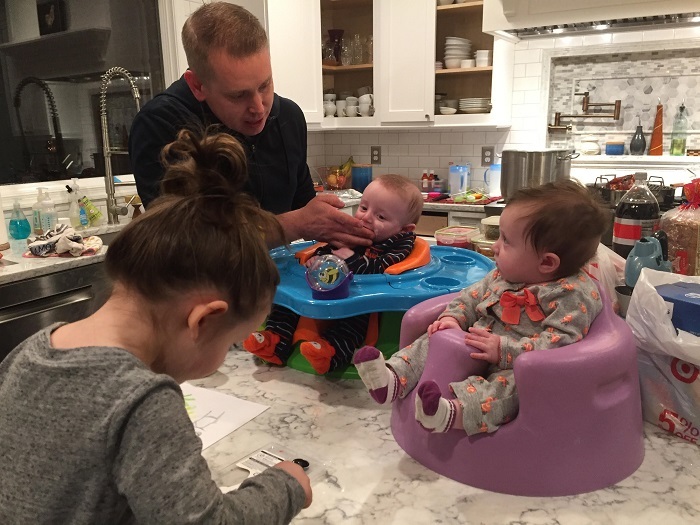 I guess that about covers this for now so I’ll close with a shot I took last week of Rob and his brood. My, times have changed, haven’t they? But, in a good way. Aren’t they cute? Love Tori’s hair. She’s going to be two in a few weeks. Time flies indeed. 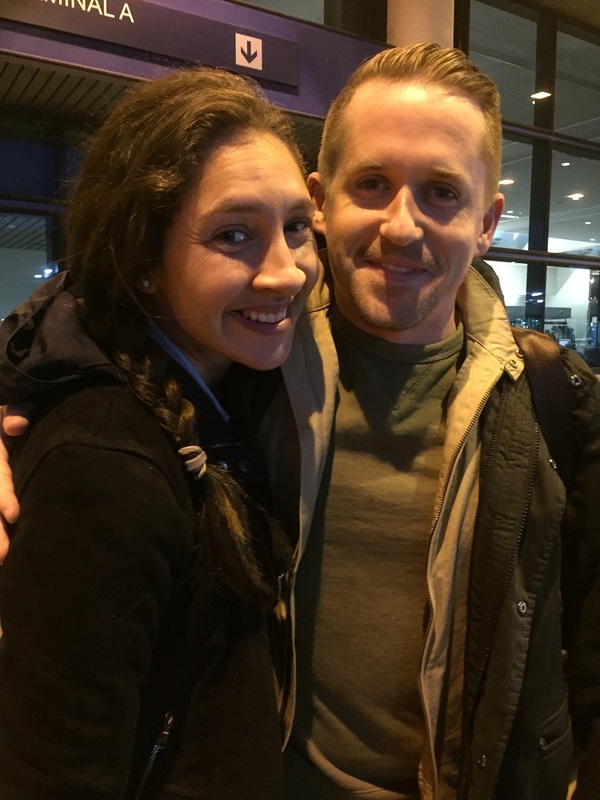 And, Christopher and his girlfriend Melody, as we dropped them at the airport last week after their visit for Thanksgiving, to head back to CA. They will be back soon. So great. Yes, things have changed, but in a really good way. So, there you have it, a bit of reminiscence of times past. We’re all grown up now and no Artemis didn’t fare so well, but for us, so far, so good. Let’s hope that our good luck holds. As far as this post goes, I hope that it doesn’t read too much like “what I did on my summer vacation”. Actually, it’s seems more like the Poseidon Adventure with sinking boats along with vacations and such. Griswold, you aren’t alone in getting a bit teary eyed about days past. Me, I have the crying gene too. Just don’t get me started. Artemis is such a beautiful boat, I am sorry that happened, but at the same time what a story and what lovely memories you have because of your time aboard it. Kiddo Chris is SO cute! I cannot wait to hear more stories through these posts and see more pictures. So glad you’re getting a scanner!